Photo by Jacqueline Bennett Preparing for the unveiling of the plaques for the CT Trees of Honor Memorial on October 11, 2014 in Middletown, CT.
Look for new road signs along major highways and local streets in the near future directing visitors to the Connecticut Trees of Honor Memorial in Middletown, Connecticut, if CTTH committee members are successful in their appeals to city officials and state representatives. The sign initiative comes as Phase Two of the CTTH Memorial is slated to get underway this coming spring, with a focus on construction of an entrance plaza and flag ceremonial area. 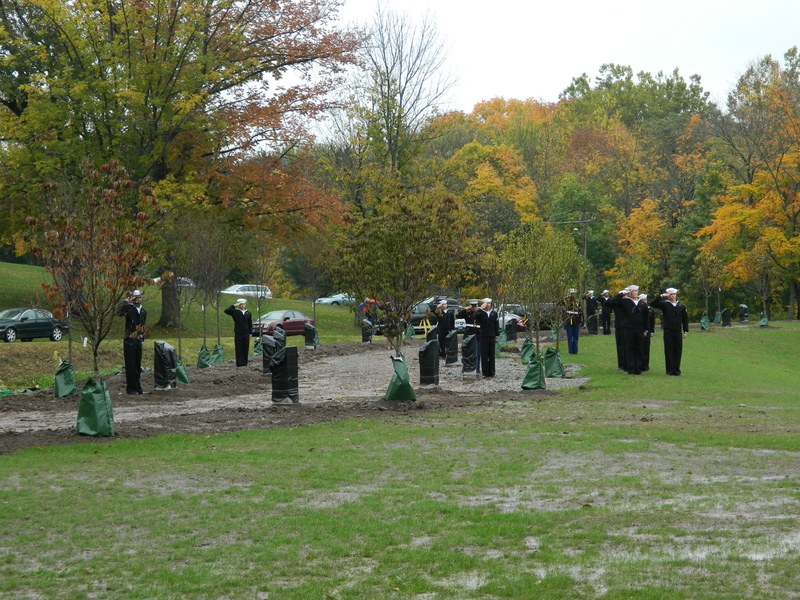 “Our committee members are most eager and busy planning for spring construction of Phase Two of the Memorial,” Committee Chairman Sue Martucci wrote in the Feb/March CTTH newsletter. Construction will be done under the guidance of construction advisor Brian Kronenberger. Martucci noted too that evergreen wreaths were placed at “each hero memorial and tree” in December as part of Wreaths Across America. Diane DeLuzio,Tom Linden, Tony Rosa, members of the South District Fire Department, Marshall Linden and Sarah Atwell helped place the wreaths, she said. With the spring thaw, brick pavers will be placed at each plaza and along the entire walkway. “We look forward to incorporating the donated, engraved pavers that supporters have generously purchased into the Flag Ceremonial Plaza as well as donated benches that will be placed throughout the Memorial area,” said Martucci. The memorial honors the fallen soldiers from Connecticut who lost their lives during the wars in Iraq and Afghanistan. Located in Veterans Memorial Park, Walnut Grove Road, the memorial also honors all American military veterans. Another aspect of Phase Two will be installation of lighting, electrical service and security cameras. Some vandalism took place at the memorial site last year but was quickly repaired by dedicated volunteers. An “impressive main statue” is to be mounted on a large base in front of the flagpoles – created by the “awarded sculptor” with a planned unveiling for the spring of 2016. In the meantime, CTTH continues to seek out landscape companies and garden clubs to design and maintain gardens throughout the memorial site. After the completion of Phase Two, noted Martucci, plants, shrubs, bushes, perrenials and gardens will be added. Go to cttreesofhonor.com for more information and to learn how to help.